Living Room with 2 sliding doors that lead onto deck. Dining Room, seating for 8. 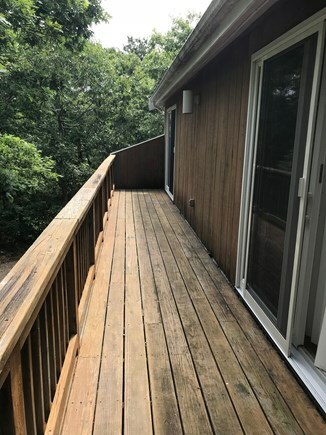 Sliding door leads to deck. The DeWitt House sits on 1.5 acres of wooded property on Vineyard Meadow Farms Road in West Tisbury. 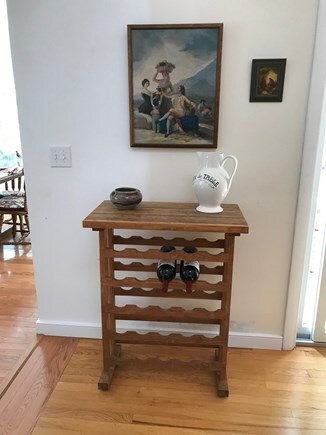 It is approximately 1 mile from the main road that runs between West Tisbury and Edgartown. You can pick up the bike path at this point. The VTA buses also pick up along this main road (MV Transit Authority). In the other direction, the house is 1 mile from the ocean at Long Point Beach. A quiet area, not far from Long Point Wildlife Refuge, the home is located toward the end of Vineyard Meadow Farms Road. The DeWitt House is air-conditioned. It has 2 floors. 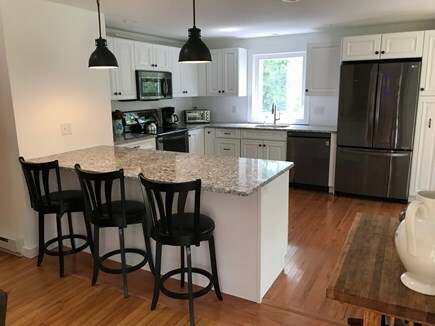 The main floor has a newly renovated kitchen (completed in 2018) with range, microwave oven, refrigerator, dishwasher, coffee machine, and toaster oven. There are plates, utensils, glasses, mugs, pots, pans, and many cooking supplies for food preparation and cooking. The kitchen counter seats 3 people, and the dining room table seats 8. There is a sliding door that leads onto the deck from the dining room. 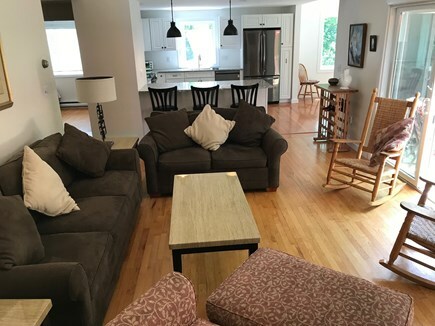 The living room, which also accommodates 8 people, has a flat-screened TV with cable service. Wifi is also available. Also on the main floor are two bedrooms. 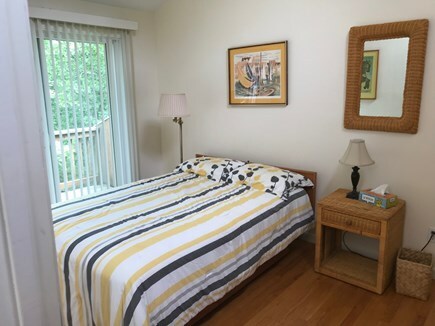 One bedroom has a queen-sized bed, dresser, nightstand, and closet. The other has 2 twin beds, dresser, nightstand, and closet. There is a full bath on this floor. The second floor is accessible by way of the stairs where you can find two bedrooms. 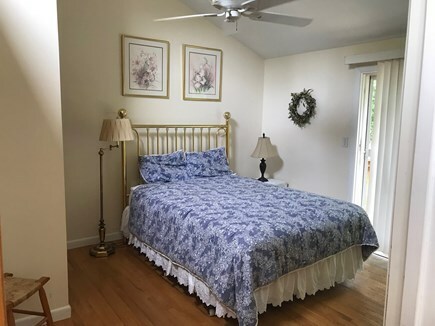 One bedroom has a queen-sized bed, dresser, nightstand, and closet. The other bedroom has a full-sized bed, nightstand, closet for hanging clothes, and a closet with shelves. Each bedroom has a sliding door that leads onto a balcony that faces northward. There is also a full bathroom on this floor. There are towels, sheets, pillows, and blankets. 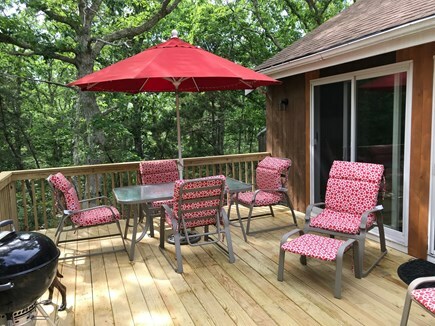 An outside shower adjoins the house on the west side, and the southern side of the house features a large deck with charcoal grill, deck chairs, and a patio table. There is a washer and dryer located in the basement. My friends and I enjoyed a great visit to Martha's Vineyard. This home is spacious, clean and comfortable. We especially enjoyed cooking dinner in the beautiful kitchen and spent many evenings relaxing on the deck. We also loved walking from the home to Long Point Beach. We'll be back and we're looking forward to our next stay at this home! We had a lovely stay at Valerie and John's place. 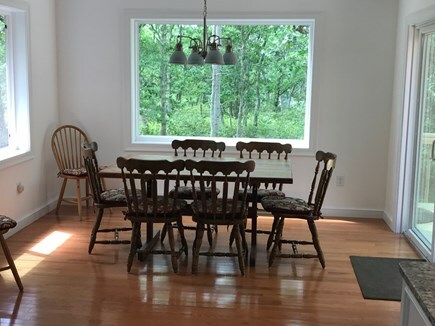 The location is private, peaceful, yet still within close access to wonderful biking and running trails, local farms, the beach, and everything Martha's Vineyard has to offer. The house is clean with plenty of space for a group to enjoy, our favorite part was enjoying the deck and outdoor shower after the beach. Great house for a Martha’s Vineyard vacation! Beautiful, relaxing, serene vacation spot! I have stayed at this cozy Martha's Vineyard getaway multiple times over the past 10 years. 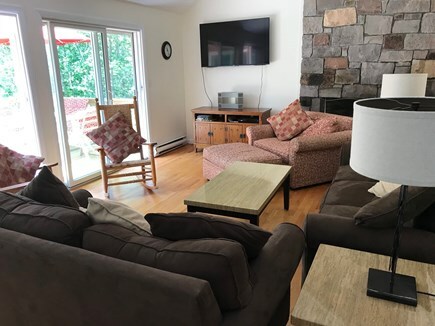 This house is located in on the outskirts of a nature preserve offering a quiet, scenic stay in a quaint MV community. 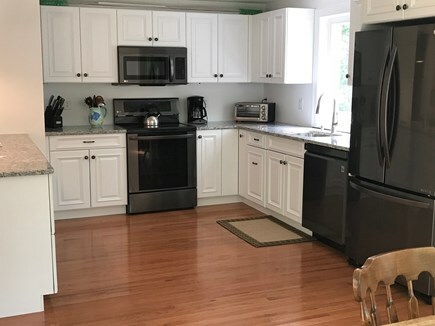 The house has updated amenities including a large flatscreen TV in the living room, hi speed wireless internet, and a newly renovated kitchen with everything you need (besides ingredients) to cook and serve a large family sized meal. 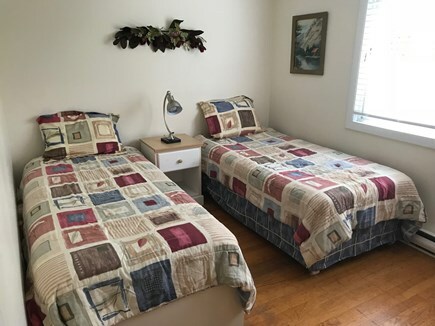 The house is located conveniently near the airport, liquor store and within walking distance from the beach and bike paths. 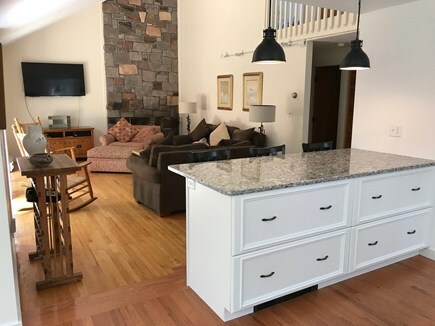 Great rental for a getaway! John and Valerie DeWitt have owned this property since 1983. The original house was built here under our direction. We have spent many wonderful times here as a couple and with our family and friends. Later, as a married couple, we spent our summer vacations here with our children. We have enjoyed Martha's Vineyard during all the seasons but love the late summer best. Recently the DeWitt house underwent renovations to the kitchen. 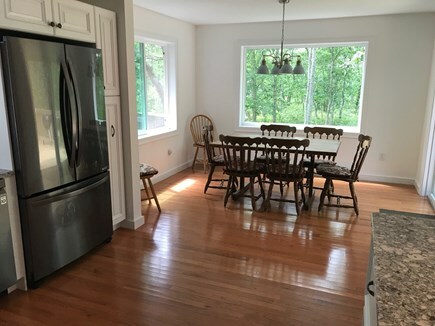 A dining room was added and the deck was replaced. We have also added air conditioning to the entire home. However, it is the location of the house that makes it special. The house is in a quiet area where visitors can rest from the hustle bustle of the Island. There is also a beautiful beach with access to the ocean and a fresh water pond about a mile away. You don't have to leave the neighborhood to get there! You do have to become a member to use it though. Of course you want to explore the beautiful island, too! 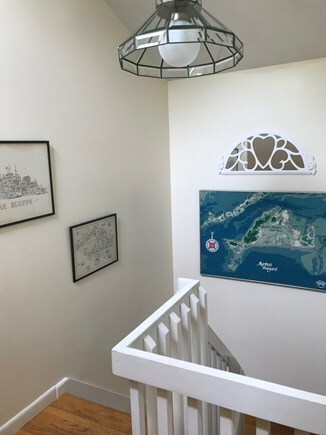 The house is about the same distance to the towns of Edgartown, Vineyard Haven, and Oak Bluffs. Driving up-Island takes a little longer and is a beautiful drive.